Creating and Editing Yearly Plans. Almost everything on the Yearly Plan is configurable. Users can break down the year into macrocycles, mesocycles and even microcycles. The system pulls through actual data into the macrocycle from strength session reps and sets to weight. Better still, the yearly plan can be used to plan for specific performance attainment from sprint times to body composition. Plan Overview: before creating a Yearly Plan, look at how the Yearly Plan is structured. Zoom: Plan Overview: before creating a Yearly Plan, look at how the Yearly Plan is structured. Users can pull through any information that they currently capture into the macrocycles/mesocycles/mirocycles. 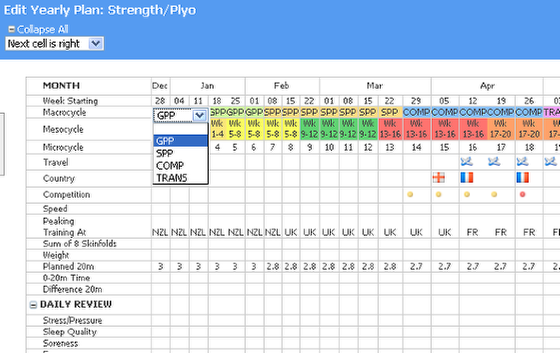 The image here shows the Daily Review and Strength Session information is being pulled through into the GPP macrocycle. Choose the athlete to create, or view, a plan for. 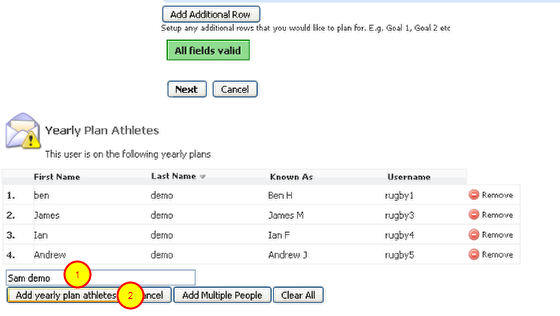 Users only need to select one athlete and then they can apply the plan to multiple athletes later. If the selected athlete is currently added to any plans, these will appear on the screen for users to select from and view. To create a new plan, click on the "Create/Edit Yearly Plans" button on the far right of the Yearly Plans page (see the step below). To create a new plan click on the "Create/Edit Yearly Plans" button on the far right of the Yearly Plans page. Any existing plans appear on the left of the page (as shown in the image here). Click "Create new Yearly Plan"
#1: Name the Yearly Plan. #2: Select the Start Date of the Plan: click in the data box and select the date for the Yearly Plan to start from. Type: Text allows user to type in text into each specific cycle/phase that can be coloured by selecting auto or none. -Type: Option allows user to write in specific options to use in the cycle such as specific blocks/phases (e.g. GPP, SP as shown above). #6: Options: users type in each option by clicking on "Add Option", then adding the option into the text area. Add as many options as required.Options can be deleted by clicking the red delete icon, and moved using the up and down green arrows. Type: Number allows users to write in numbers into the cycles. -Coloring: Auto means all text and numbers will be automatically assigned a colour. Any colors and text that is the same e.g GPP or 1,1,1,1 will be assigned the same colour and will be grouped (the cells in that row will be merged) where possible. -Coloring: Gradient allows users to select between two colors and a gradient will be shown consisting of the a range between the selected colors. -Coloring: Selection (for Type: Option only) allows users to choose the exact color that they want. The example in the image here shows that the Options of GPP, SPP are selected to be colored orange and green. These exact colors will be shown with these cycles in the Yearly Plan (to select a color for the Gradient or the Selection coloring options see below). To add or change the color of a color gradient or selection, click in the colored box (as shown in the step above) and a color palette appears. 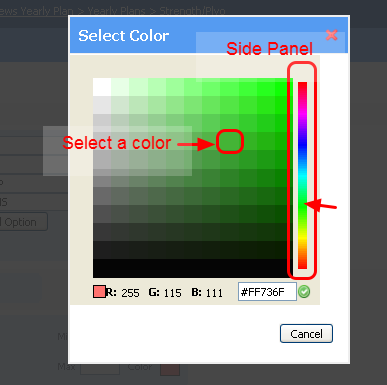 Use the side Panel color range to choose the range of colors to choose from (green has been selected here). 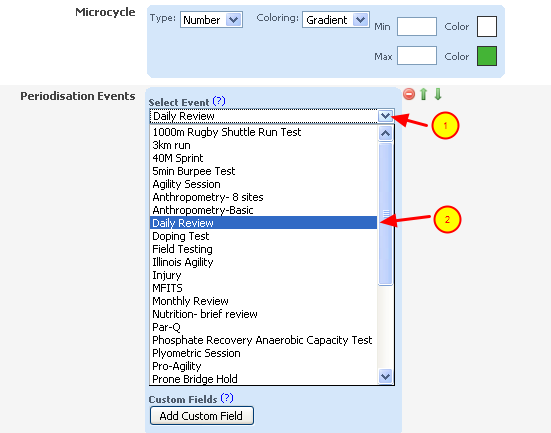 Then click on the actual cell and that color will be selected (see the image in the step below to see that the gradient color in the Microcycle is now green). Add as many Events as required using the "Add New Event" (not shown in this image). Plan for Volume and Intensity through the Yearly Plan. 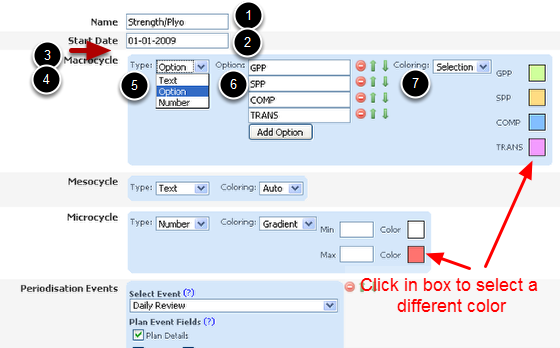 When users select the Plan Details tick box (as shown above) all of the fields from that event appear. If they want to plan actual session information for an athlete in the yearly plan, users MUST select the fields they want to be able to plan/view and these fields will be made available. #2: All of the selected fields can actually be entered by an athlete or coach directly into the Macrocycle event in the Yearly Plan. Any data entered on their calendar will also be pulled through into the Yearly Plan to give coaches an idea of how the athlete is progressing alongside other event information (such a load or volume). Events that have tables (e.g. strength, plyometric, sprint sessions) allow users to select how many times they want the fields to repeat. In the step below the exercise, sets, reps and %1RM fields will appear 3 times in the macrocycle for users to enter or view strength and conditioning information. This means the fields that are selected will appear three times in a macrocycle for planned session information to be entered into. #1 Show Volume and Intensity Chart: if this is selected a chart will appear under the Strength and Conditioning Event name on the Yearly Plan Page. It allows users to draw graphically an estimation of load and intensity throughout the year for an event type. The example here shows that the user is going graph the volume and intensity for the Strength and Conditioning event and #3 the Plyometric event. 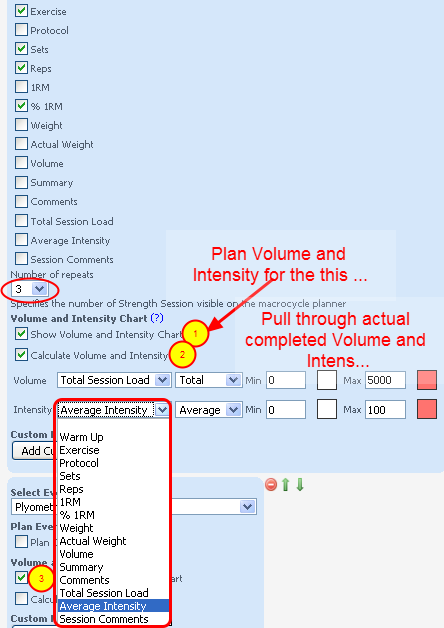 #2 Calculate Volume and Intensity: enables users to pull through the actual volume and intensity of completed sessions to be shown graphically underneath that event type. -Intensity: Average Intensity (from the strength and conditioning form) is going to be used to represent the Intensity to graph the actual intensity. The user has selected to use an "Average" of the Average Intensity over the week. This means an Average of the Intensity of the sessions will be displayed (not the total as was used in the Volume). N.B. Users can also select to show Minimum and maximum Volume / Intensity if they require as well. -Text (free text to write in anything), choose automatic coloring or none for this row. -Option (write specific options, as used in the macrocycle setup previously discussed), write options and choose color none, auto or a specific color for each available option. -Number (any numeric field), choose none, a colour gradient or automatic coloring (disussed in the macrocycle set up previously). -Bullet (yellow and red bullet). -Star (yellow star and red star appear). -Plane (plane icon appears to represent travel). -Flag (choose from the different flags of the countries of the world). #7 Choose the color for that row (none, gradient, performance standard[pre-set standards of performance]). -Numeric Difference (allows users to calculate the difference between the Additional Rows that the user has just entered). 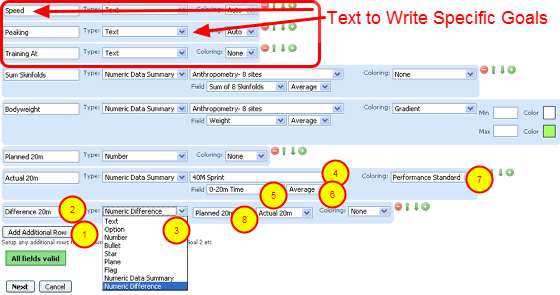 #8 Choose the two fields to measure the difference between (choose numeric fields). The example here shows that planned 20m and actual 20m data will be used to calculate the difference between . This essentially allows users to pre-plan expected performance levels throughout the year and compare them with the athlete's actual results. N.B. Please note that the additional Rows actually appear directly under the Competition information at the top of the Yearly Plan. Users can add in any specific field they require. Once a user adds in the events and the specific planning or detail information, they need to click next to be taken to the Yearly Plan overview. Now that the structure of the yearly plan has been defined, it is time to BUILD IT !! MONTH- automatically generated and cannot be changed. Week Starting- automatically generated and will start from the Start Data previously specified. Macrocycle/Mesocycle/Microcycle- it is critical for users to plan specific phases for the macrocycle. The example here shows that the Options that were set when the user created the structure are now available to select from (e.g. GPP, SPP). -The user has entered in mesocycles based on free text and is automatically colored based the different information that is entered, e.g, wk 1-4, wk 5-8 etc. -The microcycle is for numeric fields (as previously specified and shown here) and is not colored. Travel- Click on a cell along that row and an airplane will appear in that box. Click the box again and it will disappear. Country- click on the cell and then select from the list of countries flags that appear. Type in the first letters of the country and it goes directly to the countries starting with those letters. The click on the country name and the corresponding flag appears in that cell. To remove a flag, click on the correct cell, scroll to the top of the flag list and select the blank cell before "Afghanistan". Competition- Click in the box and a yellow dot appears. Click on the yellow dot and it turns red to indicate an important/hard competition. Click on the red dot and it disappears. Additional Rows- the additional rows that were added when the user developed the plan show in this section. The previously selected field types are available to use here now. Any events that were selected to "Show Volume and Intensity" will have an area of grey cells under it. To draw the INTENSITY of the workload over the year, click on the Volume/Intensity button. One click and it will say Draw Volume, click it again to access the Draw Intensity. Make sure that the button says DRAW INTENSITY. Then, users hold down their left mouse button and move the mouse cursor over the grey cells. The height that the mouse is moved across the cells indicates the number of grey cells that will be left underneath. Users need to do a single mouse button click on the last column to ensure that it does not draw over any cells when the mouse is moved back to draw the Volume. Alternatively, users can click their mouse along each column to get the correct column height. Now go back over to the DRAW INTENSITY button and click it to access the DRAW VOLUME button. To draw the VOLUME of the workload over the year, click on the Draw Volume/Intensity button. One click and it will say Intensity, click it again to access the Volume. Make sure that the button says DRAW VOLUME. Then, users hold down the left mouse button and move it over the grey cells. A blue marker will be placed at the height that the mouse is moved across the cells to indicate the Volume to be completed. Users need to do a single mouse button click on the last column to ensure that it does not draw over any cells when the mouse is moved back to draw the Volume. Adding in number of sessions thought the year. Users can add in the number of sessions based on the volume of work that they want to complete. 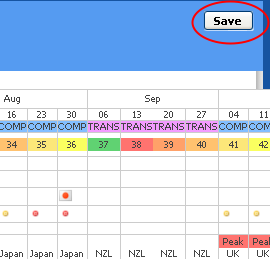 When the layout of the Yearly Plan is completed click "Save" (top right hand corner of the page). After the user selects "Save" they are taken back to the Yearly Plans List. What about the actual data to be entered into a specific Macrocycle? Once a user applies a plan to an athlete they can then go into the macrocycle and add in the actual planned data for each specific athlete. 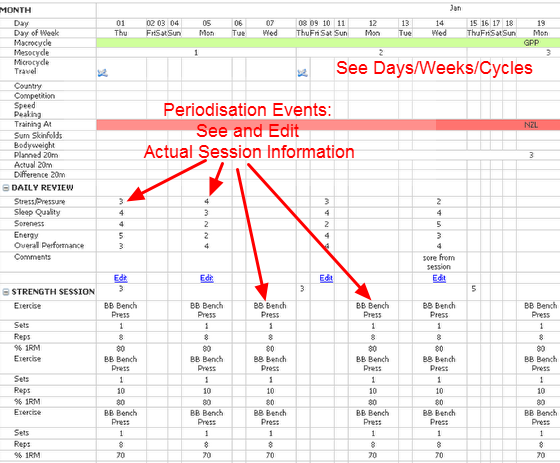 This is discussed in the "Add in actual session information into a macrocycle for an athlete on that plan" Step below. The most important aspect of setting up a plan is just ensuring that there are some specific blocks/phases throughout the year (in either a macrocycle/mesocycle/microcycle) that can be used when planning for an actual athlete. After the user selects "Save" they are taken back to the Yearly Plans List. Now a user can add in athletes to the plan. Alternatively, user can add in athletes to any plan they have created. Click on the "Edit" button on the Yearly Plan. #1. Scroll to the bottom of the page, type in the athlete's name into the athlete text area. #2. 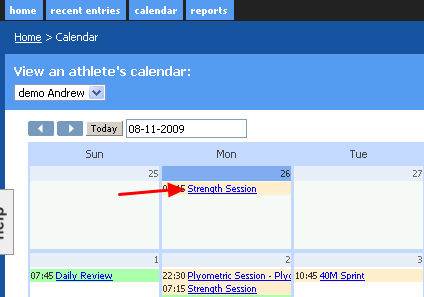 When the match appears, click on their name and then click "Add yearly plan athletes"
A green pop-up box will appear and say "person added to yearlyplan"
Once the user has added in the athlete's, scroll to the top of the page and click on the "View An Athlete's Plan" in the trail bar at the very top of the page (highlighted in the image in the step below), then select to view the newly created plan. Once an Athlete's plan is opened the athlete's actual data is pulled through into their Yearly Plan. The image here shows that the athlete's actual 20m time is being pulled through into the plan and the difference between the planned time and actual time is being calculated (each athlete added to this plan will show that athlete's data when a use views it. The sum of 8 (skinfolds) is also being pulled through to instantly to show the coach/athlete how the athlete is progressing. The graphed volume and intensity is shown on this page (the planned volume and intensity is shown exactly as specified when the user developed the plan). Most importantly, the actual volume and intensity (as previously defined as Total Session Load ( a Total) and Average Intensity (an Average) is displayed underneath. This allows users to instantly see their planned versus their actual results. In the Yearly Plan click on the "Setup Macrocycle" drop down list (top of the athlete's Yearly Plan) and select a Macrocycle, e.g. GPP. 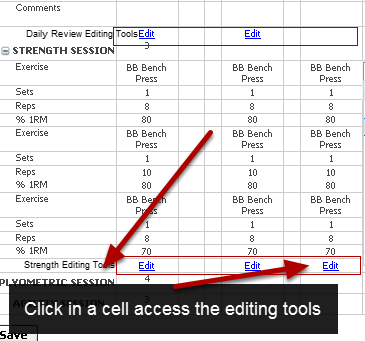 The Macrocycle will open in a separate page for users to view/ edit (see the step below). 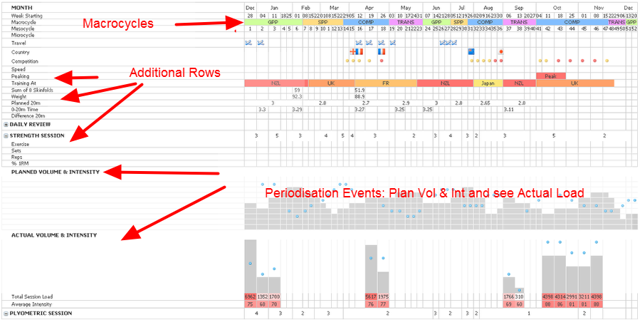 All of the information that the users selected in the Periodisation Events section for the "planned data" is being pulled through into here. 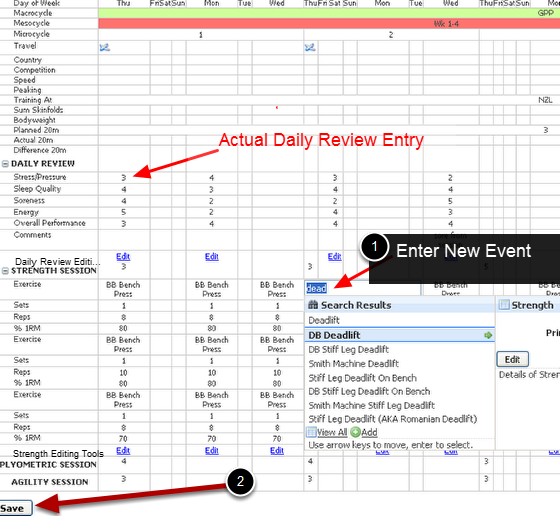 The Daily Review Event data is being pulled through directly from the athlete's calendar. The strength and conditioning session shows the repeated "Exercise, Sets, Reps and %1RM" (as specified when we set up the Plan Details) for 3 repeats from the athlete's actual calendar. Users can see the number of sessions per week and use these as a guide for planning sessions. To view the actual record entered on the system, click the "Edit" button which appears in the "Editing Tools" pop up box and you will be taken directly to the actual event form entry (as shown in the image in the step below). To add in a new event (that is saved as a draft on the specified day in the athlete's calendar) click in a row and start to add in information. The example here shows that a new strength session is being entered. The exercise database appears and the user starts to type into that cell. They simply type in the exercise name and select the correct exercise. Users add in as many sessions as they require. These sessions will now be available on the athlete's calendar and schedule as drafts/planned events (see the Calendar Step). -Once the new Events are "Saved" on the system, the Edit button will appear to be taken to the actual entry as well. To view the actual record entered on the system, click the "Edit" button which appears in the "Editing Tools" pop up box. You will be taken directly to the actual event form entry (as shown in the image in the step below). 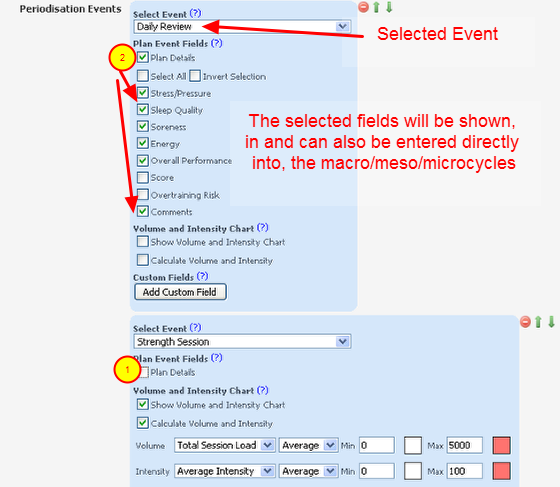 Clicking on "Edit" in the Macrocycle opens the event. The user then selects to go back to the macrocycle using the trail bar link, or they can enter in new information and click "save and close". The event now appears on the calendar as a draft event. The athlete just needs to click on it to open it (see the step below) and then save and close it. Event: the actual event as the athlete would see it. Zoom: Event: the actual event as the athlete would see it. The session information entered on the yearly Plan is pulled through into the athlete's calendar and is scheduled and formatted as an actual event. For this example, the athlete could enter in their actual session information and click "Save and Close". Next: Yearly Plan "Start Day"